Environmentally-friendly home improvement products are becoming popular among modern homeowners. The trend towards using products that help preserve our environment while improving our home spaces has led to the introduction of several new materials within the home flooring marketplace. Within this post, we’ll examine 5 of the leading eco-friendly flooring products. Cork flooring is ideal for use in family kitchens as it features anti-microbial properties that can help to reduce the number of allergens within the home. Cork is also easy to maintain for busy homeowners and can be finished using a range of paint products, providing homeowners with superior design versatility. Another benefit to cork flooring is its durability. 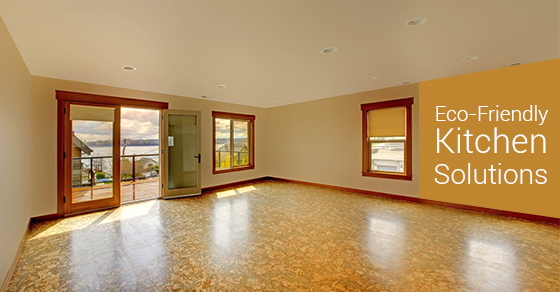 Within the right home setting, cork flooring material can last up-to 30 years. Like cork, bamboo flooring is another wood product that has been gaining in popularity in recent years. The reason behind the product’s popularity is the fact that bamboo flooring is both easy to install and easy to maintain. Because Bamboo comes available in a variety of grains, it appeals to a broad range of design tastes. It’s the type of flooring product that will work well within any style of kitchen. Within the kitchen space, it’s important for homeowners to find a floor product that offers water resistance. The water-resistance of rubber makes it a valuable option for those considering new flooring within their kitchen space. In addition, rubber also offers comfort under foot. This is ideal within a home space where a large family of people will be using the kitchen space on a regular basis. The resilience of rubber flooring materials also makes the product the ideal choice for the value-focused buyer. For those who have their heart set on hardwood flooring, reclaimed hardwood flooring products offer the ideal alternative. Reclaimed products reuse existing wood supplies and therefore don’t contribute to deforestation. The salvaged hardwood flooring is often considered the ideal product for kitchen flooring areas in beach homes, cottages, and older properties. For homeowners seeking a tiled effect from their kitchen flooring, concrete can offer the optimum result. The great advantage of concrete is that it can be tinted and polished to achieve the ideal unique appeal for the homeowner. By selecting from the various eco-friendly products on the marketplace, homeowners can find a material that preserves the sustainability of the environment while enhancing the appeal of their home. To learn more, contact our trusted team today!